Delta, one of the major Greeks, correlates the relationship between stock price and option value. Option traders use the Greeks to evaluate the risk inherent in our positions and Delta is a critical tool used to measure that liability. As we study the option literature, many of us have come across three related, but different, definitions of Delta and in this article we will explore those interpretations and relate them to our covered call writing and put-selling strategies. Delta is the amount an option price will change for every $1.00 change in share price. As an example, let’s say share price is $50.00 and the $50.00 call has a value of $2.00 and a Delta of .50. Now if share price rises to $51.00, the theoretical value of the option will move by $0.50 ($1.00 x .50) to $2.50. If stock price moved down to $49.00, the anticipated value of the $50.00 call decline by $0.50 to $1.50. Both scenarios assume all other factors remaining the same. Delta is the equivalent number of shares represented by the options position. As an example, if an option has a Delta of .60, one options contract would represent 60 shares of stock, as each share has delta of 1, by definition. This definition is often associated with a concept known as the Hedge Ratio where stock is traded against option positions. For example, if we buy 10 call contracts with a Delta of .50, we would be long 500 Deltas. To create a Delta-neutral portfolio (little or no market risk) we would have to sell 500 shares of stock. This definition is especially meaningful as it relates to strike price selection. When we are writing covered calls, we are long the stock and all shares have Deltas of 1. When we sell the call options, we are short the calls, leaving us in a Delta-positive position as our options generally have Deltas less than 1. The higher the overall Delta of our position, the greater our exposure to market risk. By selling high-Delta options (in-the-money strikes) we are limiting this market risk, lowering the amount of our total positive Deltas position and therefore increasing the hedging we are seeking in bearish or volatile market conditions. In bull markets, we would favor low-Delta options or those out-of-the-money. Delta is the percentage likelihood that, upon expiration, the option will expire in-the-money or with intrinsic value. As examples, an option with a Delta of .85 has an 85% chance of expiring in-the-money and an option with a Delta of .10 has a 10% chance of expiring in the money. This definition is especially useful to those of us who want to avoid our shares being sold if we are employing covered call writing or having shares sold (put) to us if selling cash-secured puts. In both cases, we would favor low-Delta options or out-of-the-money calls and puts. The deeper out-of-the-money we go, the lower the Delta and the less our exposure to potential exercise. Delta defines the relationship between share value and option pricing and can be viewed from at least three perspectives. The most commonly-accepted definition is the first one presented in this article: Delta is the amount an option price will change for every $1.00 change in share price. However, also having an awareness of and understanding the other interpretations will be quite useful in establishing our option-selling decisions. For the week, the S&P 500 rose by 0.52% for a year-to-date return of 2.33%. BCI: Moderately bullish, favoring out-of-the-money strikes 2-to-1. A mixed second week of earnings season with some major tech stocks disappointing. Market held up well despite this. The S&P 500 is currently in an uptrend (higher highs and higher lows) while the VIX (CBOE Volatility Index) is under 14. In the past six months, the S&P 500 is up 2% while the VIX has declined by 10%. The near term market trend is BULLISH. 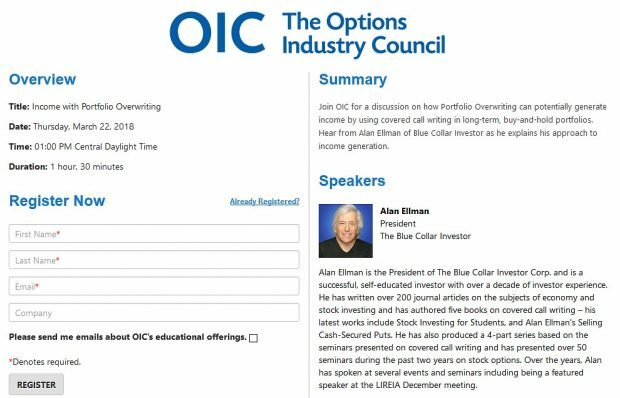 This week’s Weekly Stock Screen And Watch List has been uploaded to The Blue Collar Investor Premium Member website and is available for download in the “Reports” section. Look for the report dated 04/22/16. I may have missed something but in the complete encyclopedia, I thinking ace the 2011 classic, you go into tremendous detail explaining how to read the technicals, which I greatly appreciate. However, I did not find specific mention or too much info in the book of the optimal times to enter the stock position, I.e. the bullish crossovers of the macd, stochastic a, etc. I am a member and do get the premium report and find that upon sorting for the best stocks in the best industries, most have already accelerated into the upper zones. What are your thoughts on a watch & wait process for those stocks with mixed technicals to enter into those positions upon bullish crossovers? And then waiting for them to reach the upper zone and then sell the call option? I guess that would be a best case scenario but was just wondering if you’ve experimented with that at all instead of only buying and immediately selling when the stocks have already hit the upper zones. Technical analysis is not a precise science. In my view, it is as much an art as it is a science. A technical chart is a mosaic of a series of indicators and will be interpreted differently by technicians with no ultimate right or wrong until after-the-fact. That said, it is a critical screen and immensely useful. I also believe that acting on technical analysis is dissimilar when comparing short and long-term investing. For trading our 1-week or 1-month options, I have no issue with the stochastic oscillator > 80%. I’ve seen share prices remain overbought for months. For long-term buy-and-hold portfolios, I would look at longer-term simple moving averages for my technical analysis. Volume confirmation (and no negative divergence). If there is concern from one’s technical interpretation of a chart, in-the-money strikes can be used to generate additional downside protection. Technical analysis represents 1/3 of our screening process and each technical parameter represents 1/12 of the screening. I encourage our members to add, delete or interpret as they see fit as my way isn’t the only way but it’s worked well for my trading style for quite some time. I do not understand why it is recommended, when a stock goes way up, buy it back, closing out the old strike price. Aren’t you using your cash (in an equal amount) to buy or close out the old strike, where is the gain, it looks like just in Stock price but losing that required cash? The reason why this is one of my favorite strategies has to do with our ability to generate more than a maximum return in the same month with the same cash. If we sold an OTM strike (or any strike for that matter) and the price has appreciated well above the strike leaving the option deep ITM, the option will be trading at or near “parity” (all or almost all intrinsic value). At this point we can make no more money in this first position and our shares are worth only the strike obligation to sell. I’m a little confused too about hitting the double. If an option lost 80% of its value in the first to second week of the contract period, wouldn’t its technicals look pretty negative. For example, in my paper trading account, I’d initially bought FIVE when it passed all texts and was bold. Then a couple weeks later, it fell to the pink color and was looking pretty bad technically. Instead of thinking the double, I closed out the position entirely. Now it shows up again and bolded. I guess I’m trying to get my head wrapped around how I know when to keep the stock to hold out for a reversal in price to sell another call. Wait to hit a double: reserved for the first half of a contract (generally), no negative news, not dramatically under-performing the overall market. Roll down: Mainly appropriate in the 2nd half of a contract, no negative news. Sell the stock: Usually when there is a negative news report or dramatically under-performing the market. We do not make sell decisions based on movement from white to pink cells in our reports. Once a position is entered it is managed as described in my books and DVDs. 2. How many ‘price closes’ above a Resistance level before it can be deemed an upside breakout? 4. And am needing to figure out how would I know of the best time to reduce my investments when the market is bearish/volatile, and then for increasing investments later?,- do you do this if VIX goes above ’30’, or from the I.V of S&P500 above ’20-30′, or maybe some other technical measurement? A- Was it the result of a specific event like a large institutional transaction or an earnings release etc. B- What was the price trend prior to the spike? C- What is the trend after the spike? If the price is closing higher than the daily high on the day of the spike after that spike, we have a bullish signal. Lower than the daily low that day, a bearish signal. Keep in mind that volume is one of four of our technical parameters and must be used in conjunction with the others. 2- A breakout above resistance is most significant on strong volume. Multiple days above resistance on weak volume does not get my attention and I will rely on other technical indicators. Will get back to you on 3 and 4. 3- Bullish technicals can become mixed technical as share price declines and if this occurs early in the contract we can give consideration to buying back the option and waiting to see if stock price rebounds to then hit a double. A more egregious technical breakdown or if the decline came later in the contract, we lean more to rolling down or closing the entire position. Thank you for these weekly blogs and the conversation they create. In my study it strikes me there are two camps on the Greeks: those who use them and those who don’t. Those who do are master practitioners of the options craft. Those who don’t focus on the underlying security. I get both points of view. It is important to be precise in options selection. But no amount of options selling will vindicate a bad stock. A point well taken. Most of our members are hard-working retail investors with limited time available for investment analysis. The 3 required (non-negotiable) skills are stock selection (as you mentioned), option selection and position management. The Greeks fall under the heading of option selection as they explain why the options are priced where they are and gives us a window into the risk incurred with these options. It is not critical to look up each option Greek but it is useful to understand the relationship between stock price, stock volatility and time to expiration as it relates to our covered call and put-selling positions. In this regard, BCI will strive to provide as much information and education and we can to our general and premium members from which we can pick and choose which concepts we want to incorporate into our trading style and executions. Thanks so much to our members for providing the feedback that allows me to focus in on the topics and issues that interest you. I read an interesting article lately suggesting retirees (that’s me) should be selling cash secured puts, covered calls and credit spreads. I do all three and find it a rewarding hobby. I do them in my self directed IRA to simplify tax issues. I suspect you do not have much idle time but maybe your next project can be credit spreads – if you use them at all. I like them because it forces you to hone in on an index and/or a stock or two getting a sense of it’s rhythm and range. I would like to get your opinion about “cutting your losses” if a stock underperforms. As an example, let’s have a look at AVGO. When the stock was on the buying list, it cost between $153 to $154. By now, the stock is trading below $150 at around $148 to $149. I understand that it makes sense to get out and find something better rather then waiting and hoping. However, in order not to let that happen (and lose all the nice proceeds to an underperforming stock), what about doing a stop-loss (real or in your mind) and selling a stock once it’s below the “down protection” à e.g. with AVGO that would be at around $150. The CC would expire worthless and the nice change would not (all) be lost due to an underperforming stock. At this point it would be a naked call but if there is enough cash/margin that should not be a problem. Would you be so kind and share your experience, the pros and cons? Like always, thank you very much! I am not a proponent of naked options although it may be appropriate for investors with an aggressive trading style. My way isn’t the only way. Closing the long stock position only will require a higher level of trading approval than writing covered calls so many retail investors will not be permitted to use this technique. 3- Sell the stock depending on time within contract period, chart technicals, company news (if applicable) and performance in relationship to overall market. Even when the overall market volatility (VIX) is low, there will always be securities that generate 2-4% per month for near-the-money strikes. It’s been that way in the 20+ years I have been selling options. Now, during earnings season (now) it becomes more challenging as most of the (otherwise) eligible securities cannot be used until after the reports pass. However, if we go through the eligible stocks and ETFs we usually can achieve our goals. These are not necessarily recommendations but have a look at the May 20th expiration near-the-money strikes for EDU, FIVE, GDXJ and XOP as a few examples. There are several more especially in our recent ETF Report (new ETF Report coming out tonight). Keep in mind these 2-4% initial returns are not even for a full trading month. When an earning report is announced by a company, and the reports are positive, when is the right time to consider writing or selling an option. Should I wait a few days to see how the market first reacts in case it takes a wrong turn initially? Should I wait till the price indicates an uptrend or is stable? I saw MLNX initially react positively on the day of the Earning Report. I thought it was responding to the Earning report. The next day it headed south immediately and has settled down but not recovered. So I used your 20% rule (was actually 10% in value) to BTC the call. Your encyclopedia has been heavily read. Now waiting to either unwind altogether or wait for the market to take an upturn and see if it recovers. After a positive earnings report, frequently there are two reactions. The initial response and sometimes a secondary response after the fine print is read and the numbers are crunched. The best time to sell a call on such a security is when volatility subsides, usually in a day or two at most. Viewing the price chart of MLNX, this was not a positive surprise. This is actually an instructive example of why we avoid stocks reporting earnings prior to contract expiration. In the chart below, we see a major gap-down after a disappointing report. On April 20th the report actually came out after market close so the up and down was the last minute speculations before the report came out at the end of the day. Then once the report was out, the next day is when the majority of traders reacted based on the news sending the equity down sharply. Avoiding covered call selling during earnings reports seems to be the way to go. Before finding Alan’s material I had been a holder during many poor reports and learned to avoid those things. Of course this relates to short term trading. I second your thoughts. Avoiding earnings reports was one of the most valuable ideas I got from Alan. All the exit strategies are up there too.